Hello. Two Thousand & Fifteen. 2015 you have a lot to live up to. I've been reading every one's #olw for 2015 on IG, there have been some great words chosen. My One Little Word is 'CLARITY'. I love this word as it's simplistic, transparent & pure. I did not do #olw last year, I started & my word was 'BELIEVE', although I did not use the word physically in my work, I think looking back at 2014, I truly did believe in my ability to create. I believed in my ability to study, look after a family, be a good friend & be a good sister & daughter. 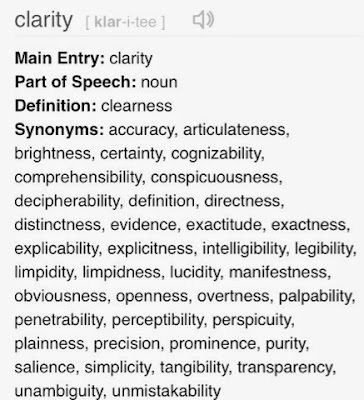 When I looked up 'CLARITY' in the dictionary & thesaurus, it jumped out at me. Why? I love all of the meanings above, they incorporate all that I believe in in my little world here & at home. My project life layouts have simplicity, I let the photos tell the story. I chose a word that resonates with me, something that is achievable & pure. I asked on IG what your #olw is for 2015, so if you haven't left a comment there, leave me your word below, I love reading them & why you have chosen the word or maybe the word chose you like mine did? In other news, late in 2014 I was emailed by Studio Calico to contribute to their class 'On the Grid', it's a class by Marcy Penner, you can find her blog here, I follow her & really love her work, & don't get me started on her planners, inspirational. To write I was excited is the understatement of 2014. I was elated, overjoyed, proud, I had manifested what I set out to do in 2014, start this blog, set up my studio, share my work, loved that you guy's liked it & look what happened. It didn't come easy to keep up with my creative work in 2014, it was hard, bloody hard, I did university full-time & worked, but I had 'belief' & 'passion' put them together & wow, look what can be achieved. I create to inspire, I share my work because I love sharing & I get excited at what I create, I create because I was born to create. I can't sit still most of the time, so working with your hands is just the best. I tell my girls all the time, it's important to get creative on anything, it lets your mind wander to other places when you need it most. Happy New Year, I truly hope that 2015 brings you everything you wish for & more. P.S. One of my favourite bands is the Paper Kites, I have shared them on here before, my favourite song of theirs is St Clarity - so wow, it was meant to be my word. You can find them here. It's as though my #olw has it's own soundtrack, how funny.